Taking a dip in a steaming tub filled with calming bath salts at the end of a stressful day can be the perfect way to relax, but with so many types it can be overwhelming trying to decide which scent is best for your needs. 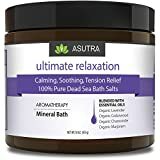 Here at Beauty Shortcutips, we strive to help you pinpoint which bath salts are best for you, whether you are on a budget or prefer a more luxurious experience, there is a bath salt on this list that’s right for you. We’ve narrowed down the list to our favorite ten bath salts. In this article you will find each product with its best features and benefits listed clearly to help you search for the one that best fits any ailment you may have. 1. Ahava’s Dead Sea Mineral Bath Salt. 2. Westlab’s Himalayan Pink Crystal Bathing Salts. 3. the Sleep Lavender salts from San Francisco Bath Salt Company. 4. Dr. Teals Pure Epsom Salt Soaking Solution, Pre & Post Workout. 5. 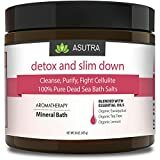 Asutra 100% Pure Dead Sea Salts. 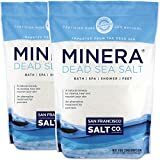 7. the Minera Fine Grain Dead Sea Salt by San Francisco Bath Salt Company. 8. Tree Hut’s Shea Moisturizing Epsom Salt in Coconut Lime. 9. Vi-Tae’s Nasal Congestion Dead Sea Bath Salts. 10. the Kneipp Juniper Bath Salts. ﻿﻿1.﻿ ﻿Ahava’s Dead Sea Mineral Bath Salt. ﻿3. ﻿the Sleep Lavender salts from San Francisco Bath Salt Company. ﻿4. ﻿Dr. Teals Pure Epsom Salt Soaking Solution, Pre & Post Workout. ﻿8. 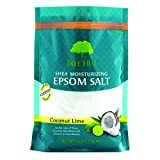 ﻿Tree Hut’s Shea Moisturizing Epsom Salt in Coconut Lime. ﻿9. 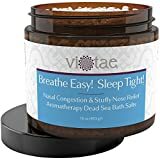 ﻿Vi-Tae’s Nasal Congestion Dead Sea Bath Salts. ﻿10. the Kneipp Juniper Bath Salts. Ahava’s salts are a great luxury product and are infused with eucalyptus which is incredibly calming and commonly used in aromatherapy. These bath salts are sure to have an amazing soothing effect while simultaneously clearing your mind and your senses. Himalayan salt has been having a moment recently with salt lamps, table salt, and other products now available everywhere, but one of the best ways to get the benefits of Himalayan salts without splurging on expensive specialty items is to infuse your bath water with them. This product’s use of lavender essential oil is great because it is the most commonly used oil as a sleep aid, not only as tea and in oil diffusers and wax warmers, but bathwater as well. Dr. Teal’s is a well-known brand and is one of the best soaks on the market for its value. As the name suggests, these salts are particularly useful when soaking your muscles before a workout, which can help prevent soreness, or using them after, to ease aching joints as well. Our fifth pick is great for those seeking salts that have aromatherapy benefits and is it the Asutra 100% Pure Dead Sea Salts. These salts are packed full of essential oils like ginger, rosemary, and peppermint, which are great for energy and revitalization. Oils like these that delight the senses and are quite zingy have the opposite effect of more calming oils, like lavender and chamomile, which you will see in the next product. Ginger is known to have a detoxifying effect on the body, while rosemary and peppermint are sure to awaken your senses. With essential oils of lavender, cedarwood, and chamomile, these salts are a powerful aromatherapy tool. These three oils combined offer a wonderfully relaxing experience. Together they can help ease you into night time so it’s recommended that you use this product only when you feel the need to destress. Because these are only scented naturally, they are calming and the most spa-like salts on the list. They are also great for a variety of skin conditions including eczema and psoriasis. These bath salts smell like summer in a bag. The coconut and lime are a great combination. And they have the added benefit of moisturizing your body thanks to shea butter, a natural skin conditioner. With key ingredients of pine needle oil and niaouli oil, these salts will open your sinuses for easy breathing and sleeping. It’s great for kids and adults alike, especially when they are sick or congested due to illness like a common cold. Pouring a small handful of these into their bathwater will instantly help clear their nasal passages without the unpleasant use of a vapor rub. These salts have natural anti-inflammatory properties and the berry soothes inflamed muscles. Like the bath salts we saw earlier for pre- or post-workout, Kneipp’s salts are also great for this. The pain from sore muscles often prevents you from doing any further workouts. Thankfully, these salts will help you recover more quickly. At Beautyshortcutips, we only recommend products that have been tested by numerous reviewers so you know you will be purchasing a product that has been tried and loved by many people just like you. These ten products will each give you a unique bath time experience we hope relaxes, soothes, and invigorates you. Because each bath salt contains certain ingredients and everyone’s skin reacts differently to specific oils and moisturizers, we’ve included a question and answer section below that we hope will further help guide your search for your next favorite product. Keep these in mind when choosing a bath salt. I want the product to moisturize my body when I come out of the bath. Is there anything specific I should look for in the ingredients list? Absolutely! Keywords like “butter,” “conditioning,” and/or “nourishing” are sure to keep your skin healthy and glowing. I want the product to have a detoxing effect on my body. How do I know which product is right for this? Look for bath salts that contain essentials oils such as lemon, tea tree, and ginger. These ingredients are commonly found in other beauty, health, and skincare products that help to rid the body of toxins it collects throughout the day. What happens if the bath salt gives me a rash or makes my skin red? Immediately stop use of the product. Try another brand that is unscented and see if the rash continues. You may be allergic or sensitive to certain ingredients because of the oils they contain. This reaction is very rare, as each of the salts mentioned here are all-natural, many of them even organic. How are bath salts different from bath bombs or bath oils? Bath salts are unique in that they offer an invigorating zing to your bath time. They stimulate the body and many have detoxing effects, which is a great treat for your body. As they infuse the water and sink into your skin through your pores, they work from the outside in, either helping you relax or giving you energy. Bath bombs have few benefits besides moisturizing the skin and adding bubbles to your bath water and bath oils are only designed to moisturize the body. Most do not have detoxing or refreshing effects on the skin. What if I don’t see any salts on this list that I like? Bath salts come in many more varieties than the ten we have listed here. If you have a particular scent you enjoy smelling, do a search with that keyword and the words “bath salts” after it. You are sure to find a brand that suits not only your preferences, but also your wallet. The price of the product depends on the brand. Most are inexpensive. You can always find a brand that fits your budget. 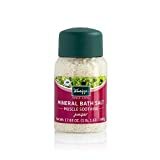 How do I know if I’m getting a good value when buying bath salts? Every bag or tub of salts will have the size (or quantity) listed on the front label, most likely in ounces of pounds. Compare the price of the ones you like most with the size and prices of other brands. Obviously, some brands are more expensive than others if they are sourcing more exotic or hard-to-get ingredients. These are luxury brands. But there are just as many value brands as there are luxury brands to choose from. Checking the size versus the quantity will ensure you are getting a good value for your money. The bath salt Beautyshortcutips feels is the best for everyone is… Ahava’s Dead Sea Mineral Bath Salts. This product checks all of our boxes because it’s excellent for anyone with a sensitivity to strong scents. Because it’s absent of any extra oils (that many of the other products contain), it can help clear blocked sinuses and offer incredible relaxation during your bath time without there being an overpowering odor. It is the product most likely to calm and soothe your skin in the most natural way. It has received excellent reviews online so you can be sure it’s a genuinely exceptional product. The pros and cons are all very helpful! Well written article! I’ve started taking baths a few times a week to help with muscle relaxation. These all look like wonderful bath salts that’ll do just the trick thank you! I have used bath salts f a couple of times and the feeling it had on my body is amazing. although, I have always stuck with a particular brand, I guess, it is time to try other brands with better features.